The Camargue® is an innovative aluminium pergola/terrace covering equipped with an automatic watertight bladed roof system. 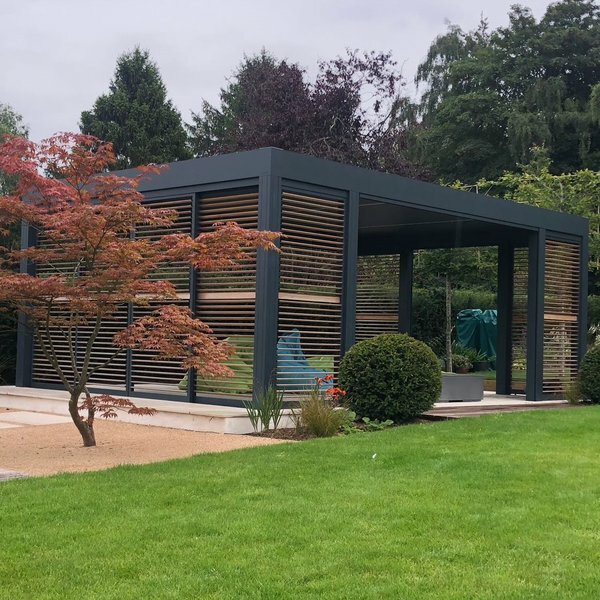 Simply add any of our side elements to make your canopy completely enclosed using automatic windproof sun protection side screens, glass sliding doors, wooden Loggia® sliding panels or a combination of these. The roof consists of extruded aluminium blades that can be tilted to adjust sunprotection and ventilation as required. During showers, concealed guide water channels drain the water towards the columns. This water drainage also operates when the blades are opened up when it has stopped raining, and this ensures that your furniture remains protected. For a PDF brochure, simply click on the link above. For quotations, costs or simply design ideas feel free to chat with our talented landscaping team, please call 01903 774 774 or email us info@gardenhousedesign.co.uk. We can also help with aspsects of paving, decking and any landscaping elements to your garden design when we carry out the full installation of your choosen terrace cover. 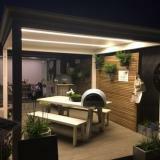 Garden House Design is proud to be a RENSON® Premier Ambassador and all our installations are done by our own team who are fully trained by RENSON®. 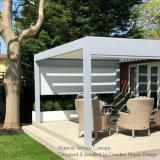 **indicitive price presented is based on a 3m x 4m Camargue canopy excluding delivery and installation. Sizes: from 2m x 2.7m to a max. 4m x 6.2m with a vertical clearance height of up to 2.8m. Multiple Camargues® are be joined if larger sizes are needed. Colours: Standard pallet of beatiful naturals, including Whites, Creams and Grey tonings. Also available in all RAL colours Powder-coated (60-80 micron) for a minimal surcharge. Operate your Camargue® easily by means of Somfy® remote control. You can operate your roof and/or screens, lights, heat and sound. Also interfaces with your smartphone, table or computer. The rotating blades provide sunprotection and ensure the necessary cooling and ventilation. When lourved roof is closed, it becomes completely water-proof. The Camargue® includes a gutter which drains the water away from the blades into the columns/legs via PVC intergrated drainage pipes so water re-direction is available.This also means that your furniture underneath will not get wet when you open the roof blades. Quiet operation. Simply operate your terrace cover, roof, blinds, lights and more with your Somfy remote control. Can be interfaced with your smartphone, tablet or computer. Integrated LED lighting options available. Why not personalise! Simply add different elements on the front and back and/or sides with motorised windtight screens, available in a many colours, glass sliding doors or wooden sliding screens. Enjoy every moment of the day by including integrated lighting, heating elements and even music!